The OpenShift Online Starter platform is available for free: visit https://manage.openshift.com/. It is based on Red Hat OpenShift Container Platform 3.7. 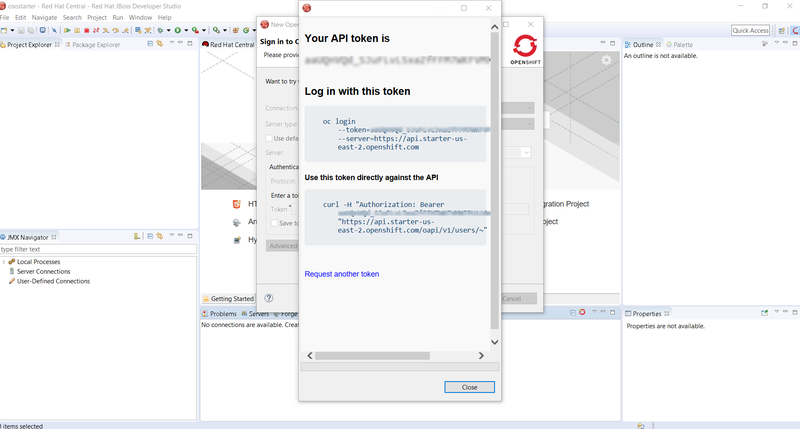 This offering allows you to play with OpenShift Container Platform and deploy artifacts. 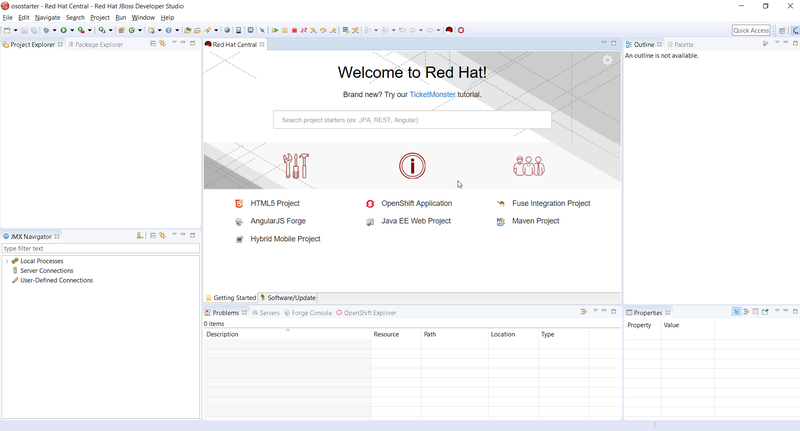 The purpose of the article is to describe how to use Red Hat JBoss Developer Studio or JBoss Tools together with this online platform. 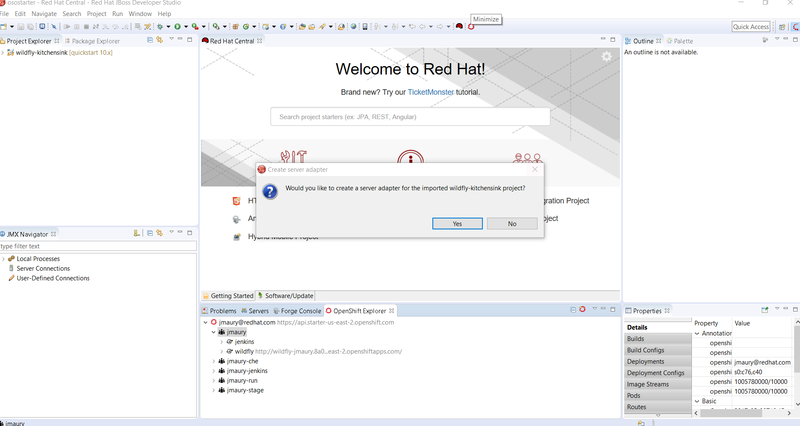 If you have not already installed Red Hat JBoss Developer Studio or JBoss Tools, go to this webpage: https://developers.redhat.com/products/devstudio/download/ and follow the instructions. 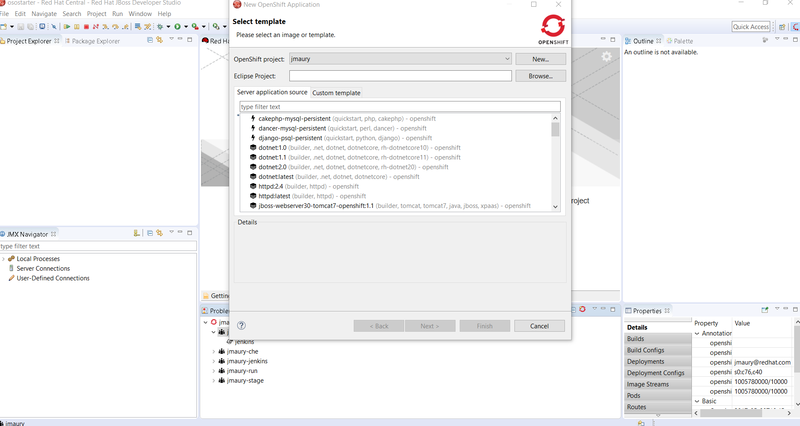 If you install JBoss Tools onto an existing Eclipse installation, make sure you select the Jboss Cloud And Container Development Tools‘. If you’ve installed Red Hat JBoss Developer Studio, launch the devstudio.sh (on Linux or MacOS) or devstudio.bat (Windows) script. 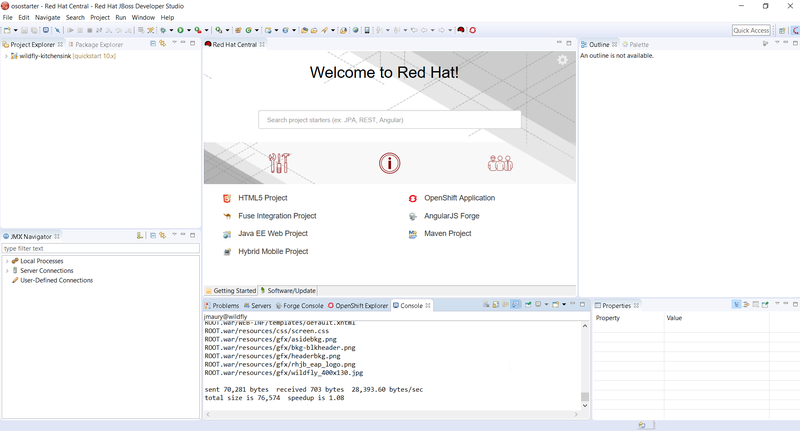 We are now ready to play with the OpenShift Online Starter platform. 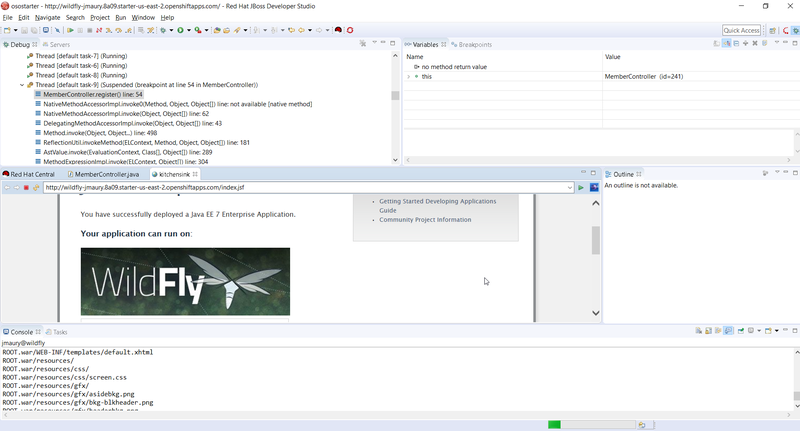 Let’s see how we can deploy and debug applications. In the following, we will use the OpenShift project that is named after you name to host our deployments. 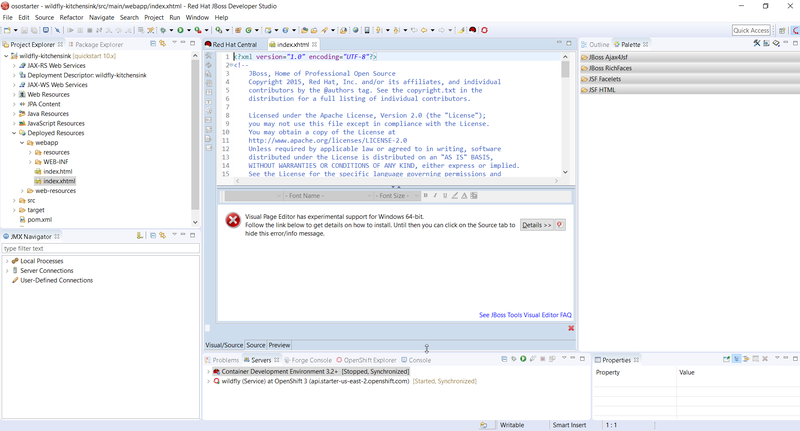 Once the source files for the application have been successfully imported, you will be asked to create a server adapter. Answer no as we need to check our deployment first. 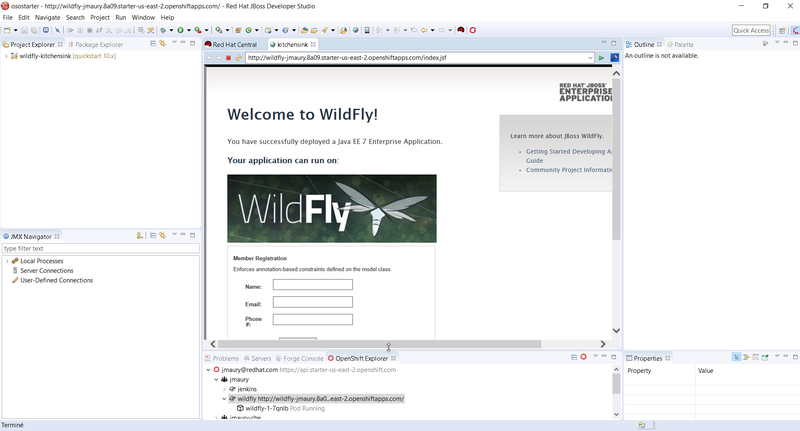 If you don’t see the ‘wildfly-1 Build Running’ item, then this means that the build has run and this item should have been replaced by the application one. 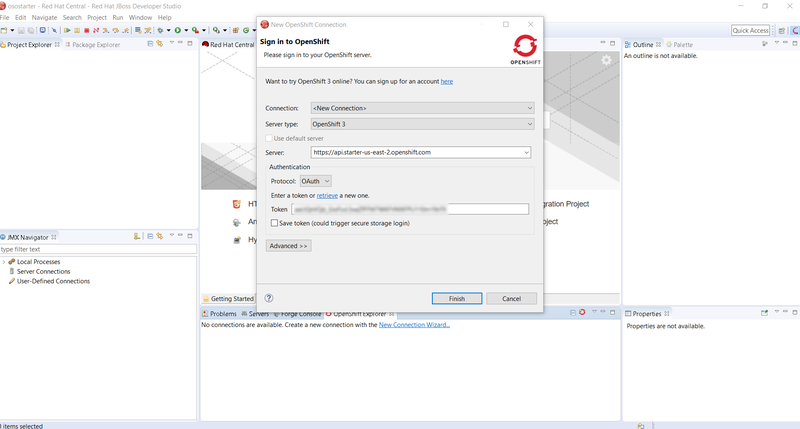 It’s very unlikely as resources are constrained on OpenShift Online Starter and the build took around 1 minute to complete when writing this article. 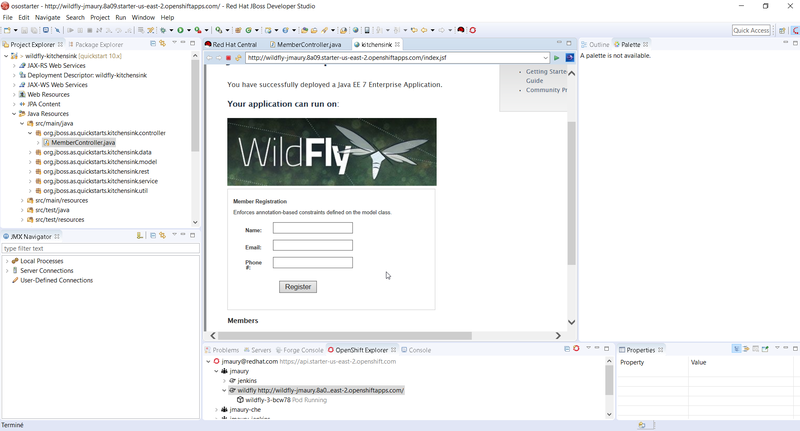 The name of the leaf item is dynamically generated but should follow the pattern: wildfly-1-suffix. 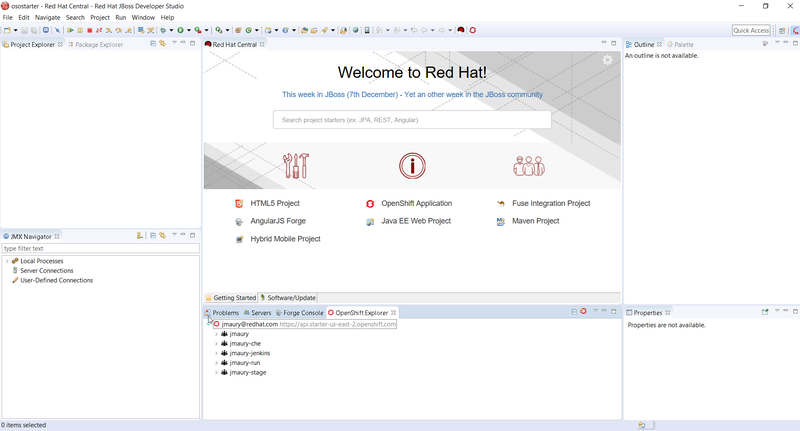 If you can see this, then the application has been successfully deployed on the OpenShift Online Starter platform. We are now ready to switch to the next phase, debugging. Before we go deeper, let’s explain where we are. 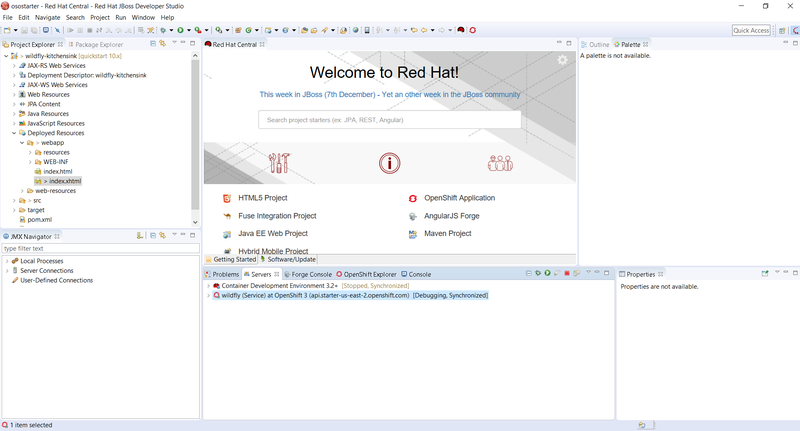 We’ve deployed an application on the OpenShift Online Starter platform, and we also have downloaded the application source files in our local workspace. 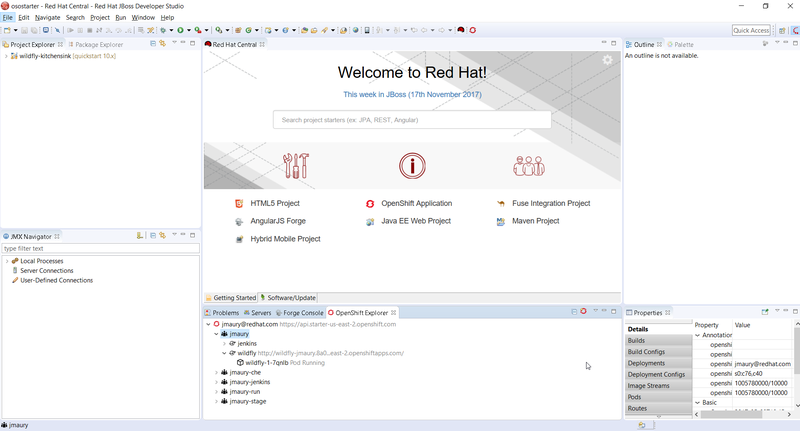 Red Hat JBoss Developer Studio will allow the same user experience for developers when dealing with cloud-oriented applications than for local applications: a local change to an application source file should be available without restarting the application, and debugging the application code should be allowed even if the application is running on the OpenShift Online Starter platform. 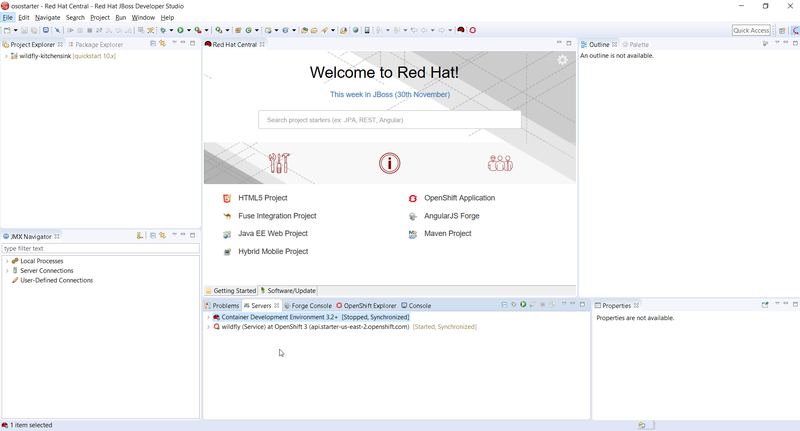 Red Hat JBoss Developer Studio provides a tool called the OpenShift server adapter that acts as a synchronization tool between a local Eclipse project and an OpenShift deployment (it can be a service, a deployment config or a replication controller). run: this is the base mode. 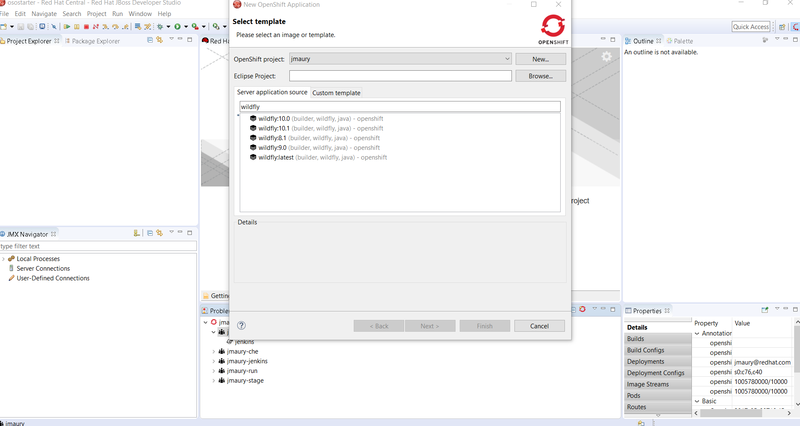 It offers changes synchronization between the local Eclipse project and the OpenShift deployment. Each time a modified file is detected on the local project, the changes are sent to the OpenShift pods. 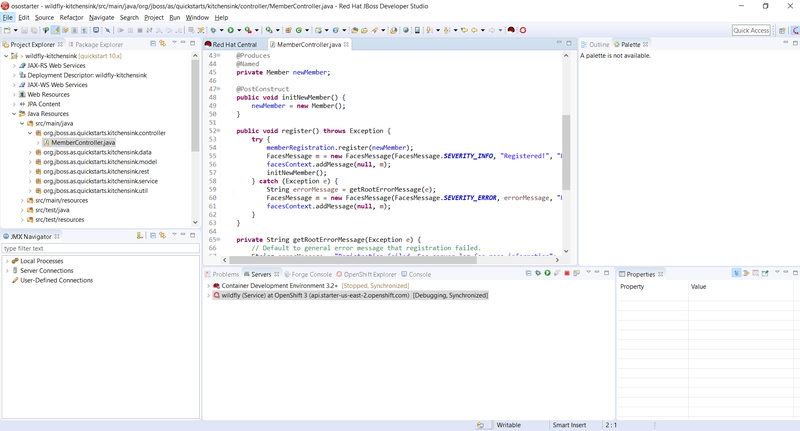 The file can be a Java file and the .class file will be sent so that the new code can be immediately checked. 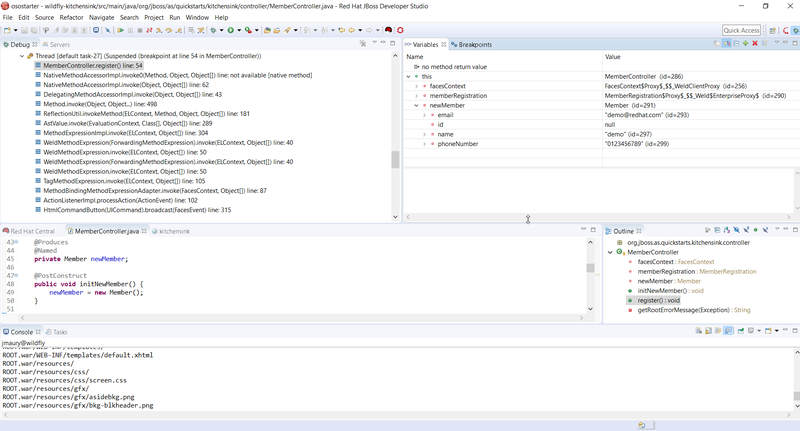 But this can be also a .jsp file (presentation layer) so that the user interface can also be checked as well. 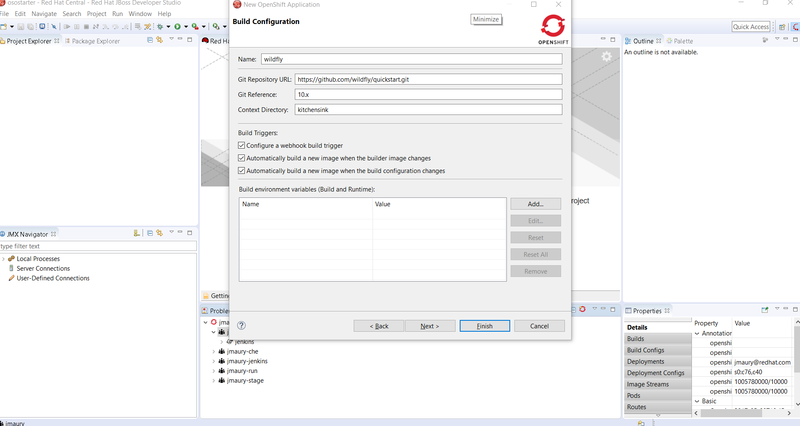 debug mode: this is an advanced case where you have all the synchronization features of the run mode but in addition, the OpenShift deployment will be updated so that the remote JVM is now launched in debug mode and the local Eclipse will also start a remote Java application configuration, which will be connected to the OpenShift pods of the OpenShift deployment. 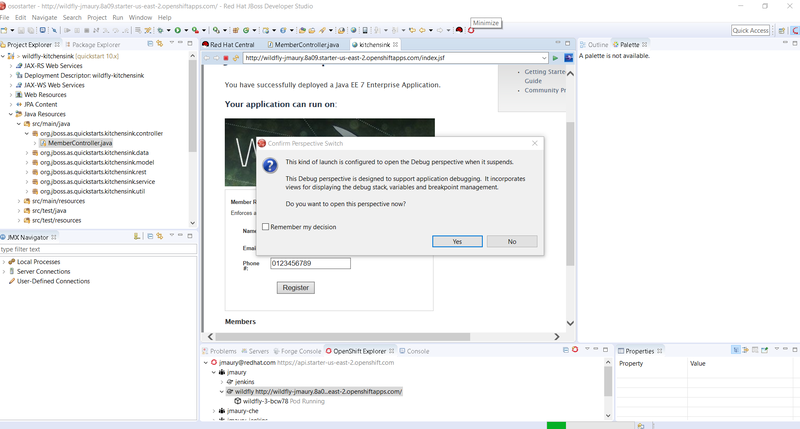 So, if you put breakpoints in files for the local Eclipse project, and if that specific line of code is executed on the remote OpenShift platform, then your local Eclipse will stop execution and display the debugged file!! Isn’t it amazing? So now that we have an OpenShift deployment available and the corresponding source files in our Eclipse workspace, let’s play!!! 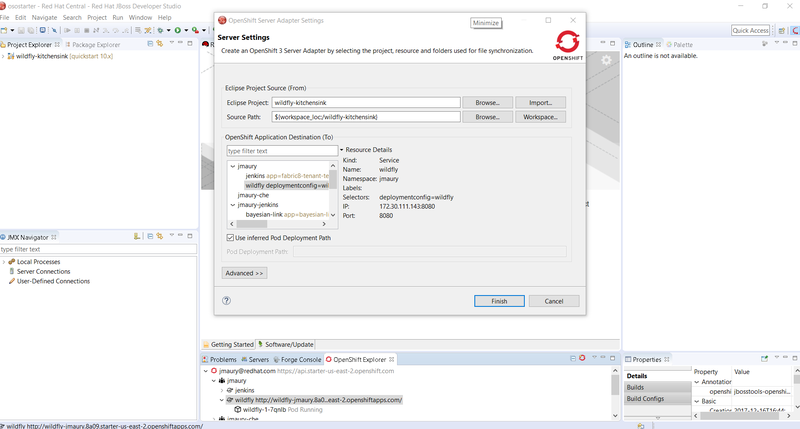 In order to create the OpenShift server adapter, you need a running deployment and a local Eclipse workspace. As we have one and we downloaded the application source files, this will be easy for us. 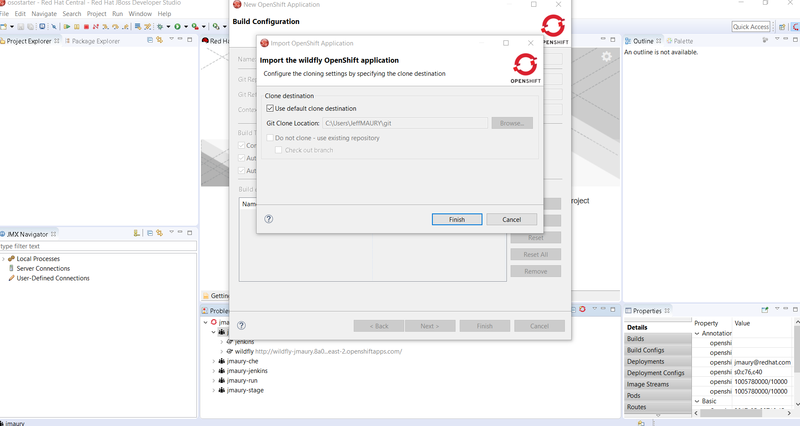 You should select the local Eclipse project that will be synchronized with the OpenShift deployment and the OpenShift deployment. As we have a single Eclipse project in our workspace and a single OpenShift deployment, they will be automatically selected and you can use the defaults so click the ‘Finish‘ button. 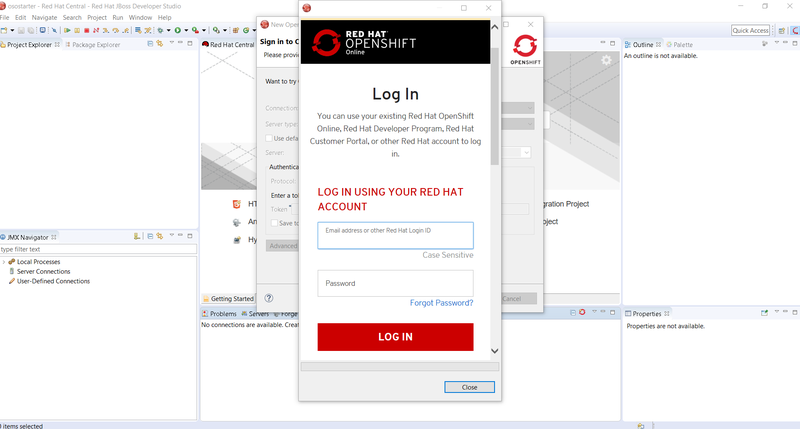 In this scenario, we will modify the welcome page of the application and check that change has been propagated to the OpenShift deployment. save and close the editor (Ctrl + W). You should see some messages in the ‘Console’ view: changes are propagated to the OpenShift deployment. Let’s check that this is real !!!! As you can see, the title of the page has been updated !!!! Now let’s go a little more complex and debug our application. Next, we need to set a breakpoint in the application code. As the application allows to register new members, we will set a breakpoint where the registration is done. 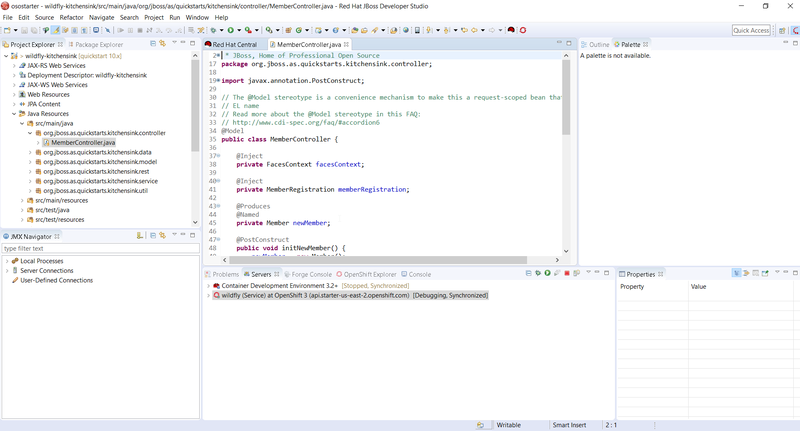 As the application is designed following the MVC pattern, we will put the breakpoint into the controller. We’re now all set. 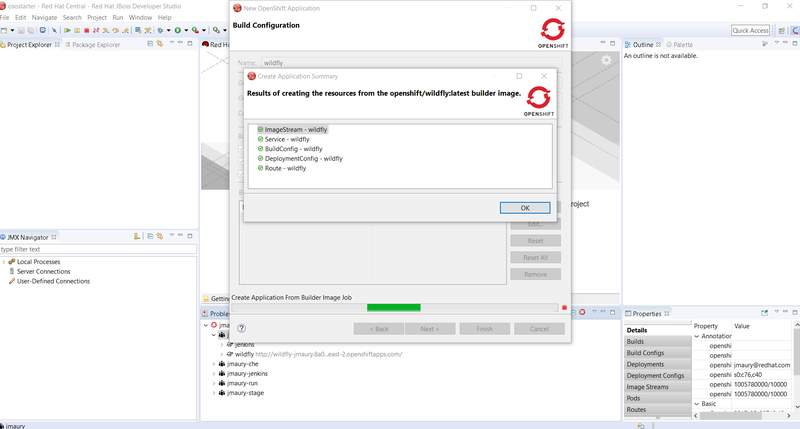 We have our deployment running in debug mode thanks to the OpenShift server adapter restarted in debug mode and we set a breakpoint in the application code. We need now to reach that line of code so we need to launch the application user interface for that. In the displayed form, enter any name (demo), an email address and a telephone number (must be between 10 and 12 digits) and click the Register button. Then you can step (in or out) in the code just like with a local Java application. So, you’ve just discovered how trivial it was to debug a remotely deployed Java application. And we have even more. 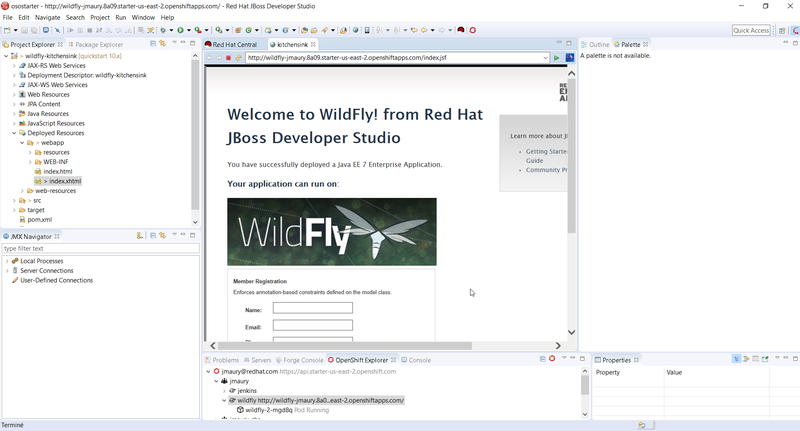 Red Hat JBoss Developer Studio also allows the same user experience for NodeJS based applications!! We will cover this in the second part of this article. 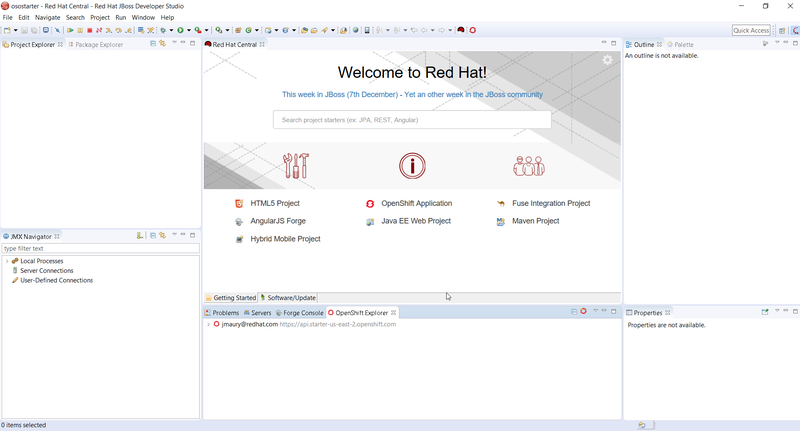 Red Hat JBoss Developer Studio is available for download, install it today.